Log cabins in Branson are some of the best accommodations in the Ozarks that feature fully furnished kitchen where you will find it easy and convenient to make homemade cool treats for kids. These comfy log cabin accommodations at Thousand Hills Golf Resort don’t just offer a relaxing vacation in a calm environment but will also let you experience a luxurious and comfortable way of living. Log cabins in Branson are some of the best lodging options offered by Thousand Hills as they are beautifully located near the theatres hosting live entertainment shows, exciting attractions, retail shops, and restaurants. Log cabins in Branson are some of the most widely patronized accommodations at Thousand Hills Golf Resort because of its beautiful location in a secluded area along the hillsides of the Ozark mountains. This log cabin accommodation is perfect for the whole family who wants to enjoy a great bonding moment with the kids while preparing cool treats. As these log cabins in Branson feature fully furnished kitchen, it’s just easy for guests to prepare homemade cool treats for kids. Going with bananas is a fun treat idea for the families in a cozy log cabin accommodation full of summer-lovin’ kids. 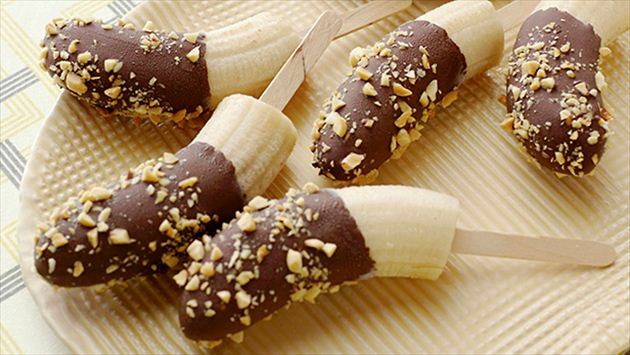 These delicious chocolate-covered frozen bananas will make your kids go ape. A good idea for adding sweets to those bananas on your kitchen counter, these guilt-free frozen treats can easily be made by hands and dipped in a variety of fun flavors. To get started, use bananas that are ripe, but not over-ripe, and stick the popsicle stick into the bottom before placing your fruits in the freezer for an hour. For dipping and toppings, use nuts, toffee, peanuts, coconut and some Smucker’s Magic Shell dipping chocolate. A homemade cool treat will sweeten up your summer with tropical beach flavors. Here is an excellent recipe for pineapple sorbet. This is made simply with fresh organic pineapple, sugar, water, and a squeeze of lemon. This bright and sweet sorbet can be easily made with the help of a handy food processor or blender. As long as the sorbet gets a good chill time in the freezer, no ice cream maker is required. Just hollow out the inside before adding the mixture back in for freezing. If your kids have an undying love for Nutella, why not make a Nutella treats for them. Many of us might have tasted the delicious Nutella and yogurt popsicles. Paring the best of both worlds – the tartness of Greek yogurt with Nutella’s scrummy goodness – these summer sweets is just easy to make. These two ingredients only require some chilling time in the freezer. This sweet pair is perfect for a cold afternoon treat especially when you are hoping to spend less time in the kitchen and more time playing with your kids outside. With the fully furnished kitchen that you can enjoy in your log cabin accommodation in Branson, it’s just easy to make homemade cool treats for your kids.